Step 1. In your cart, enter the code CEUK in the empty field and click "Apply." Step 2. 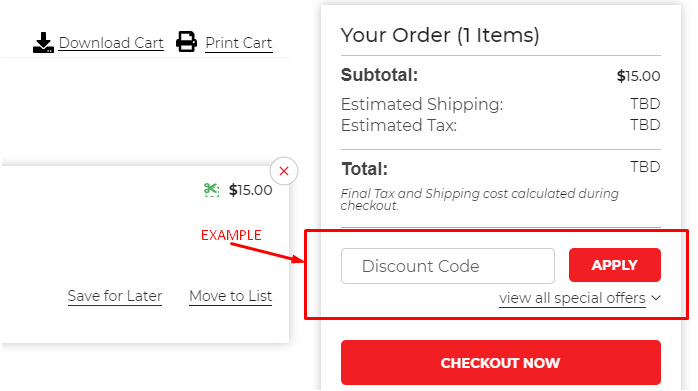 Your savings will be shown in cart immediately. Gift cards, tax, and shipping and handling costs do not count toward qualification for discounts or free shipping. Factory-direct items ( ) do not count toward qualification for discounts. Qualification for free shipping is determined by the order merchandise total after any discount is applied. Merchandise orders totaling $59 or more ship freight free via FedEx Best Value whenever possible. There are a significant number of items that are included in the discount exclusions. Discounts do not apply to Blick’s Best Price items ( ), Manufacturer’s Minimum Advertised Price items ( ), Clearance items, or Blick Gift Cards; however, these items, except for Blick Gift Cards, can count toward qualification for discount. Discounts do not apply to bulk discount prices ( ) or other quantity break prices; however, if applying a discount to the original price of the item results in a lower price than the bulk discount price, we will charge you that lower price. Free Shipping does not apply to items delivered by truck ( ) or orders to be shipped outside the contiguous 48 states. Additional handling charges may apply to factory direct ( ) and oversized ( ) items, and to items marked as exceptions ( ). For complete details related to our shipping policies, please review the shipping information included in our customer service section. Free Shipping does not apply to Expedited, Fast2Day, and Overnight Express Shipping. Blick’s Offers are based on what our competitors are doing. We use our offers as a price-matching tool to make sure we always offer either the same prices or lower prices than our competitors. Read our Price Match policy for more information. We don’t want price to be the reason you don’t shop at Blick, so we continually scour competitor websites to make sure you always save more money when you order from us. We want ease of use on our website (including mobile searches and purchases), our unmatched product assortment, and our excellent service to be why customers return to us again and again. Blick Offers typically change once or twice a week based on what our competitors are doing. Our base prices don’t change very much during the year, with a few exceptions. One example is Back to School, when manufacturers offer us discounts ranging from 5–10%, and we immediately pass those savings on to you.